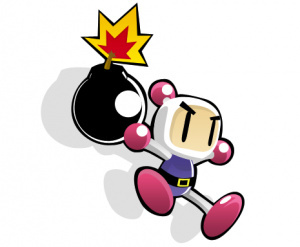 Hudson brings their Bomberman series to DSiWare! Over the years we've seen the Bomberman series make appearances on just about every video game system around, and now Hudson are bringing their hit multiplayer series to Nintendo's DSiWare service with the announcement of Bomberman Blitz! Below is a snippet of information from the official press release you can take a look at for more information on the upcoming DSiWare title. Prepare for epic online multiplayer action on Nintendo’s DSiWare service in the form of Bomberman Blitz. Published by Hudson Entertainment, the North and South American publishing arm of HUDSON SOFT, Bomberman Blitz will provide the classic Bomberman action that gamers have loved for more than 20 years to Nintendo’s download service available on the DSi. With Wi-Fi play and 8-player multiplayer action available, bombers around the world will be blasting each other away in Bomberman Blitz. Bomberman Blitz will allow on-the-go gamers the opportunity to showcase their bombing skills locally or across the world with the ability to play up to 8 players at home or online through the Nintendo Wi-Fi Connection. Bomberman Blitz will feature the ability to do battle in 10 unique locations, all making good use of the DSi’s capabilities with dual screen spanning arenas. 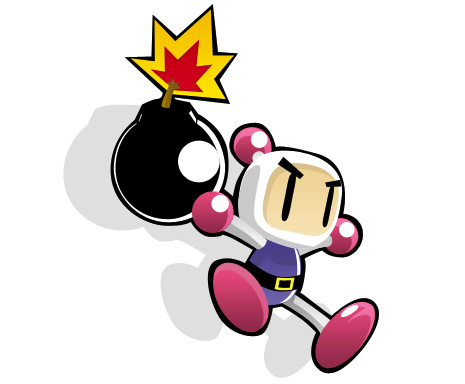 The power-ups that Bomberman fans have come to love are also all there, including the chance to increase the number of bombs, strengthen blast range, boost running speed and much more. For those who have always wanted to get in on the Bomberman action but didn’t know how, a training mode has been included that allows newcomers to learn the easy-to-play Bomberman gameplay and get in on the fun. We'll have more information on Bomberman Blitz as it becomes available, as well as a full review when the game hits the DSiWare service. Online?! Insta-buy! This is great news. Yay Hudson! Nice! Going to be getting this one. Good play from Hudson. Only thing is I've got more Bombermans than any other game series. I have Land Touch 2 already with classic bomberman play. I used to own Bomberman 2 as well. I have the wiiware one too (Blast). Besides, I need a storage solution! 8 player online multiplay = purchase. 8 player online multiplay + confirmation that it actually works this time = purchase. Online?!! Nice to see a fully featured dsi game rather than 'Bomberman Express'. I think that I will play this more often than the wiiware version. @Chicken: ...what's that on your head? This is an instant buy for me! "Epic" and "online" sound oh-so-good together. "a major DSiWare title that should make many of you very, very happy." I do have to say that DSiWare is now getting more interesting. Here I was thinking that I would only have Furry Legends: Beginnings and Reflection to look forward to. See pretty much everything above. Can't wait. @Outrunner-It's a headcrab from Half-Life. But I have no idea how it wound up on his head. @Odnetnin I think everyone's guess of Shantae was the correct one. Found this image http://www.nintendopower.com/images/NP247_Shantae.jpg at Nintendo Power that talks about it. @Cheezy: That's what she said. So, 800 pts, or premium? While this is a must buy for me (when I get a DSi), I can't quite trust directors of marketing. "It's a headcrab from Half-Life. But I have no idea how it wound up on his head." You know which Hudson game I would love to see on DSiWare? Level sharing/editor... I think this game would do rather well similar to the Mario vs DK 3..
Online play + Bomberman = Epic win and buy. I guess I just wondered where you'd been hanging out that you were subject to the dangers of Headcrabs. Carry on, brave soldier. Instant buy. No-one can say DSiWare is crap now. actually bomberman blitz is only 500 points, and even though i've never actually played bomberman i will get this one as soon as it comes out!